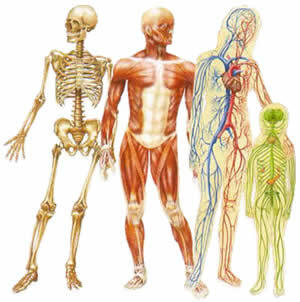 Read some fun human body facts and find out more about bones, skeletons, eyes, blood, muscles, the brain, heart and much more. You will love the cool information featuring weird facts, crazy trivia, funny truths and other interesting information that will help you learn about the amazing human body. That dust on rugs and your furniture is not only dirt. It’s mostly made of dead skin cells. Everybody loses millions of skin cells every day which fall on the floor and get kicked up to land on all the surfaces in a room. It takes about 60 seconds for one blood cell to travel a full circuit of your body. On average, a woman’s body produces about 1/2 a million eggs. However, only a few hundred of these eggs will ever have the potential to be used to get the woman pregnant. A typical human gut contains about 100 trillion microbes or about 10 times as many cells than make up the human body. On average, your kidneys will filter around 1.3 liters of blood every minute. Further, the average person urinates about 1.5 liters of water per day. In just 30 minutes, the average person’s body produces enough heat to boil a 1/2 gallon of water. You have enough capillaries in your lungs (about 300,000,000) that if you stretched them out end to end, the line would extend from Seattle Washington to San Diego, California (about 1300 miles). The higher your IQ, the more you dream. Facial hair grows faster than any other hair on the body. The nail on the middle finger grows faster than the other fingernails. The acid in your stomach is strong enough to dissolve zinc. It doesn't destroy the stomach because the stomach walls constantly renews itself. Men burn fat faster than women by a rate of about 50 calories a day. A man has approximately 6.8 litres of blood in the body while women have approximately 5 litres. Babies are always born with blue eyes. The melanin in their eyes needs time to be fully deposited or to be darkened by ultraviolet light to reveal the baby's true eye color. Your skeleton keeps renewing itself every ten years which means that every ten years you get a new skeleton. It is impossible to kill yourself by choking yourself with your hands. A normal human being can survive 20 days without eating but can survive only 2 days without drinking. The only part of your body that has no blood supply is the cornea in the eye. It gets its oxygen directly from air. The colder the room you sleep, the higher the chances are that you would get a nightmare. Three hundred million cells die in the human body every minute and everyday and adult produces 300 billion new cells. Humans shed and regrow outer skin every 27 days. About 32 million bacteria call every inch of your skin home, but they are mostly harmless and some of them are even helpful. The hardest bone in the human body is the jaw bone. By age 60, most people will have lost half their taste buds.